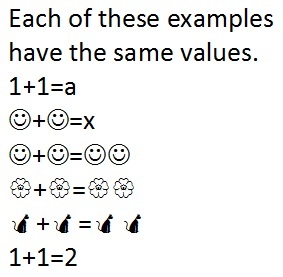 Many children lose their confidence in their reasoning ability when they start learning math that includes replacing values with a character – example: x+4=6, where x=2. A really good teacher helps children past this point without too much difficulty, but that presumes that all the children are paying attention at the moment this concept is explained and that your child’s teacher is a really good teacher. I know that I was confused when this concept was first introduced. Replacing a number with a letter of the alphabet is the same as giving it a nickname, so you and your teacher both know which number is missing or which number you are giving as an answer. If you asked children to think of math this way and teach it this way from the outset (the very beginning of learning it), all children would have a much easier time learning math. One day when I have grandchildren, I will be teaching them math in this manner and introducing the additional concept of how to move numbers from one side of the equals side to the other, as soon as they understand the difference between addition and subtraction. I plan on encouraging them to think of math as a game and a puzzle that can be fun and interesting, rather than let them be discouraged and frustrated by the current educational system.